In my coat closet post I mentioned that we have an emergency snack bag. 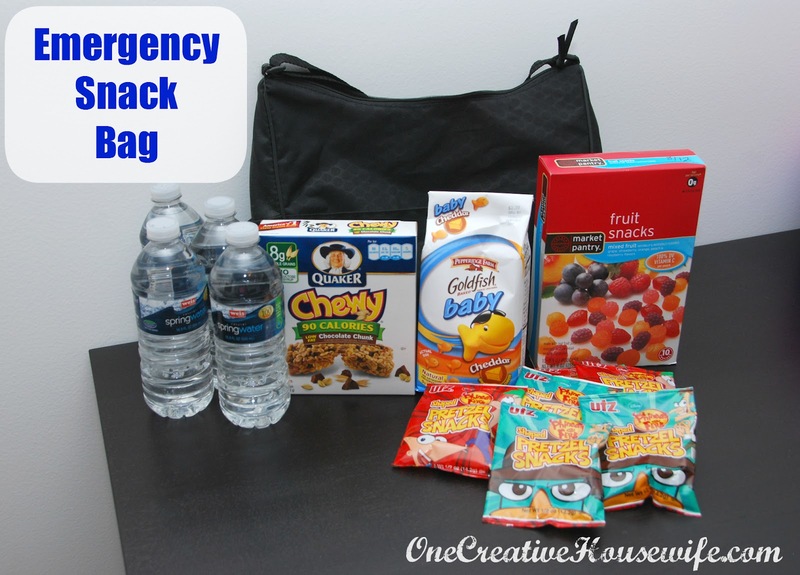 I got an email wondering what an emergency snack bag is, and if it is important to have. I can't say it is important to have, but it is definitely handy. If you know me in real life, you know I am accident prone. Unfortunately that extends to those around me too. A graceful family we are not. My husband and I started dating in January 2000 and since then, we have had about 1 emergency room / urgicare center visit a year. I'm talking anything from horrible black out migraines, a severe case of mononucleosis with an enlarged spleen, a broken foot, knocked out teeth, and a pitchfork stabbing. Yep, you read that right, a pitchfork stabbing. One day while doing yard work I accidentally stabbed my husband in the arm with a prong of a pitchfork *face palm*. Thankfully, the pitchfork did not hit the bone, and he only needed a tetanus shot. When it was just the two of us, we handled these ER visits in stride. Once we had kids, we quickly learned that waiting in the emergency room with a hungry, impatient toddler made the wait a lot harder. After our first ER visit with our children, we implemented an emergency snack bag. It has changed over the years as our children's needs have changed, but the concept has remained the same. I include some bottles of water, snacks that won't expire for 6 months, and photo copies of our current insurance cards. Every six months when I change the batteries in our smoke detectors I refresh the supplies. I even write the date I place the supplies in the bag on them. 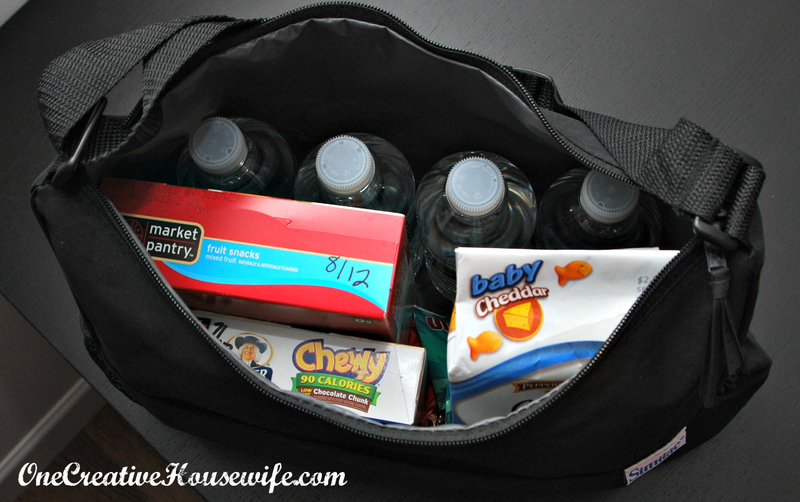 The snacks I include are things are kids will eat without fail. In this case granola bars, Goldfish crackers, and pretzels. I also include some bribery food like fruit snacks. The bag I store it in is the free diaper bag I got for the hospital when I had my son. It is actually a cooler bag so I could add ice packs if necessary. I know you are thinking it is simple enough to grab something on your way out the door to the ER. Trust me I was very happy that all I had to do was grab a prepacked bag when my son feel off the couch and knocked his teeth loose. They were pointing straight back in his mouth. I was a little to preoccupied with trying to calm my son and daughter down, get them out the door, call the pediatric dentist, oral surgeon, and my husband to worry about packing something. This is also the bag I grabbed when I had to go watch my friend's kids while she took her other child to the ER. Her kids were happy to eat a special snack while they were waiting for their mom and brother to get home. ~Contact numbers that you may need in an emergency (i.e. your child's school/daycare, partner's work, etc.) -- I like to keep that in my wallet. You never know when you may need to give this information to someone. I know you are thinking I have that in my cell phone, but what if you left your cell phone at home, or you are talking on it and need to give the information to someone. ~Entertainment items for your kids. -- I keep an extra bag of coloring items and games in our vehicle at all times. ~A comfort item for your kids. -- My kids have a "car" blanket and stuffed animal. The only leave the vehicle to be washed. I hope this is a bag you don't need to use a frequently as we do!!! I can not tell you how important my ER bag is!!!! I use an old backpack with lots of pockets. I keep a pair of my pjs and a few toiletries (for in case they get admitted and I have to stay) a 2 decks of cards (even littles can use them to play matching or go fish) a note pad and colored pencils, baby wipes (for cleaning dirty faces and butts lol) a few diapers for my youngest, granola bars, fruit snacks, few bottles if water, 2 rolls of quarters, pop tarts, a couple tea bags and some instant coffee, a first aid kit with gauze, gloves, barf bags and instant cold packs in case I need to do any treatment in route, ibuprofen for me again, a word puzzle book and a small flash light. I also have a list if important info and the numbers of all the food places that deliver to the hospitals we use. My son got burned while I was making dinner and since they admitted him I still had to feed everyone. They fed him because he was the patient but 10pm cold plain turkey and diet pudding cup didn't go over well. Thankfully he was allowed to eat what he wanted so cheese pizza and sloppy fries were awesome! I keep a bag in my car with dn extra outfit per kid (comfy not jeans). I have never had to change out my bag because we use it often enough but I would do it every 6 months too. Yikes! I hope our ER visits don't end up being that frequent. Although at the rate my son is going they will be!!!! Sounds like you are one prepared momma! I have a car bag too, that has clothes, pjs, and toiletries for everyone, just encase we end up getting stuck somewhere. I love the idea of having a list of numbers of all the food places that deliver to the hospital. I think I will be using that tip! Thanks for stopping by!! !